All images are the authors’ own. These distinctions between official and vernacular cultures become particularly relevant when we enter the realm of the First World War centenary. There are many organizations that are currently grappling with the question of what they should commemorate: the official grand narratives championed by Government or the multi-narratives that have been generated at various levels in Canadian society. 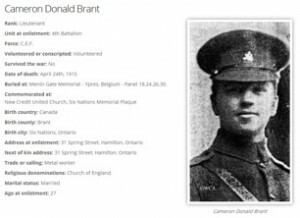 Since its founding in 2012, the Great War Centenary Association, Brantford, Brant County & Six Nations (GWCA) has explored these issues, while seeking to find a way to honour the contributions of the more than 5,000 men and women who served from the three named communities. In consultation with local educators, community and professional historians, and various historical organizations, the GWCA has striven to balance these two foundational objectives in its bid to educate people about the role these three communities played during the First World War. This balancing act is best demonstrated through the GWCA’s unique website (www.doingourbit.ca). Although in some instances these articles retell official histories, the infused local content provides the reader with an understanding that, although these events have become a part of the national discourse, the people who experienced them may have understood them in ways that lay outside of the officially prescribed narrative. Further challenging dominant perspectives on the Great War, the GWCA devotes considerable space to local narratives that counter the official discourse. While Brantford and Brant County’s wartime narratives are remarkably similar, they are countered by Six Nations’ understanding of their wartime participation. Their willingness to fight alongside Britain was grounded in a vision of their people as equal partners rather than citizens or wards of the Crown. Although this divergent position emerged before the war, as seen in the GWCA article, Loyalty to the Crown, it was heightened during the Conscription Crisis of 1917. Based on their alliance relationship, and following their past military participation with the British, the Six Nations knew that, as an independent nation, they could not be forced into another nation’s (Canada’s) military. The tendency among those who promote official memory is to streamline the narrative, eliminating moments or themes that divert attention from the central story elites hope to propagate. This results in a bland, flattened narrative that loses the richness of the more complex story of the War. In order to combat this streamlining, the GWCA has deliberately focused on other controversial elements of the war experience. Thus, its website deals with incidents such as the deportation of 98 local “Turks” (actually Alevis) to Kapuskasing, the acts of aggression against local inhabitants of Italian or German origin and the passionate debates aroused by the introduction of conscription in 1917. Through the “We Remember Database”, the GWCA also highlights stories of racial discrimination, as in the case of Edith Anderson Monture, a nursing sister from Six Nations. Unable to obtain a nursing degree in Canada due to her ethnicity, she moved to New York, received her degree, and enlisted and served overseas in the American Army Medical Corps. To complement its website, the GWCA engages in a variety of outreach activities. It organizes an annual Great War lecture series at Laurier Brantford that explores the conflict from local, national, and international perspectives. 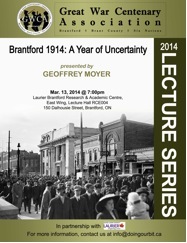 Past lecturers have explored themes including Brantford’s predilection for cadet corps, the CEF’s shifting view of sport and Ottawa’s framing of mothers as martyrs and heroes. The GWCA also organizes commemorative events around key anniversaries (the outbreak of the war, 2nd Ypres, the mustering of local units), screens motion pictures of interest and works with elementary and secondary school educators to develop curriculum compliant lesson plans on various themes. 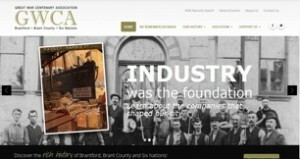 To assist in these efforts, the GWCA has developed partnerships with organizations such as the Imperial War Museum, Wilfrid Laurier University, the Brantford Public Library, the Woodland Cultural Centre and the Six Nations Legacy Consortium among others. Running through the work of the GWCA is the conviction that, in patiently researching and carefully illuminating the experiences of men and women from the three constituent communities – famous, infamous and anonymous – we are contributing to the ongoing historical conversation regarding Canada’s role in the First World War. And by deliberately looking at the controversial and the unsavory as well as the heroic, we are problematizing the official memory that threatens to eradicate the local and impose a partial understanding of the Great War experience in Canada. Peter Farrugia is an Assistant Professor at Wilfrid Laurier University, Brantford. Evan J. Habkirk is a Ph.D. Candidate at Western University. John Bodnar, Remaking America: Public Memory, Commemoration, and Patriotism in the Twentieth Century (Princeton NJ: Princeton University Press, 1994), 13-14. Ministry of Education, The Ontario Curriculum, Grades 9 and 10 Canadian and World Studies (Queen’s Printer, 2013). See “Battles of the First World War”; available at http://www.doingourbit.ca/battles-first-world-war. Just wondering what the rationale was for attacks on citizens of Italian origin during the First World War? Guess I should check the website.